A body is discovered with the dismembered parts of six victims stitched together like a puppet, nicknamed by the press as the ‘ragdoll’. Assigned to the shocking case are Detective William ‘Wolf’ Fawkes, recently reinstated to the London Met, and his former partner Detective Emily Baxter. The ‘Ragdoll Killer’ taunts the police by releasing a list of names to the media, and the dates on which he intends to murder them. Ragdoll had been sitting on my TBR pile for a while, taunting me. So when a request went out for reviewing this as part of a blog tour, I took up the challenge of reading this over the weekend. While this was daunting, it quickly became difficult to put down. From the opening page, to the very last sentence Ragdoll takes you on journey where it is difficult to tell where it was going to go. Though I knew that the Ragdoll killings were somehow connected to the Cremation Killer from the opening chapter, I couldn’t see how the pieces fit together. To top it all off, we have this list of six people and when they are scheduled to die. This swinging pendulum adds more tension to the book. Not only do the police have to find the killer, they also have to do their best at protecting the people on the list. This cat and mouse game is played out under the watchful eye of the media. This macabre reality show plays into this faceless killer, with a “countdown” clock running and resetting with each death. It reflects on what lengths that the media will go to in order to get those elusive viewing figures and at times it becomes uncomfortable to read. The value of human life and suffering is reduced to the number of people are tuning in. With the instant news updates and everyone becoming a journalist, it made me question the media’s role in these type of situations. Though this is fictional, other real life events could also be treated in this way. Though the central role in this book is Detective Wolf, the other’s who become entangled in this game add different perspectives to the tale. This case changes the lives of all involved. The three other characters who I felt were impacted greatly were Wolf’s former partner, Baxter, his Ex-wife Andrea and the recent transfer from Fraud, Edmunds. It is clear from early on in the book that Wolf, Baxter and Amanda have a troubled history. Wolf and Baxter have a real complicated relationship. There were rumours of something more than that of partners, but while it feels that these deeper feelings may be more on Baxters side than Wolf’s, you can see why people would think this. Yet, Wolf has been keeping one of Baxters secrets from the world and though it didn’t feel like a romantic relationship you could tell that these two were close. As for Andrea, she is forced into an impossible position. Torn between a loyalty to Wolf and her career aspirations, The Ragdoll case would have been the story that she would have jumped at. You see a real crisis of conscience doing battle in Andrea. Though she feels that she could do the story justice, the darker side of the media is laid bare and she really is conflicted. I thought this was an interesting side to the book and though Amanda wasn’t a huge part of the book, she did play an important part. The final supporting character I found interesting was that of Edmunds. I could see why he didn’t get on with the other’s on the team. He was an outsider and through his own investigation, he shone a light back on to the workings of the team. He seemed to thrive on the challenge of getting to the bottom of the mystery. Yet, it is at the sacrifice of his personal life. Though he does have a natural ability for this work, he is forced to make a choice at the end. It was interesting to see this side to a character. The main character, Wolf is very much the anti-hero of the book. As the book progressed, you could tell that the Cremation Killer case had a profound effect on him. Yet, throughout the book I couldn’t help routing for him to catch the killer. 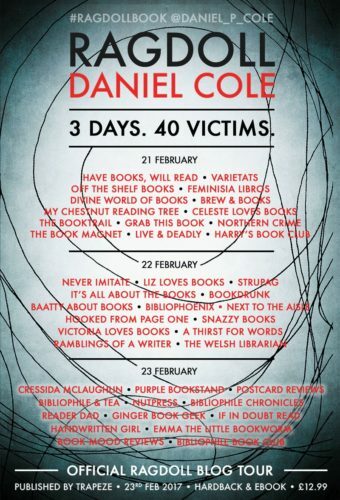 As the book hurtles towards its conclusion and time running out for the last victim on this list, Wolf still battles on. Truths are exposed and it leaves those still standing to pick up the pieces. 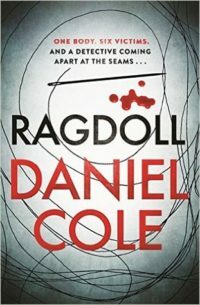 Ragdoll is a fantastic debut novel and one that takes the reader on thrilling ride. There are so many twists and turns throughout the book, that at times I had to go back and forth to try to figure it out. Even then, I was still unsure where it was going. Cole is an author to watch and I really can’t wait to see what he releases next. IF you like books that keep you on your toes, pick this book up. You won’t be disappointed.